A small, blue-colored, Dragon Digimon child. Although it is small and powerless, it has the potential to evolve to every Dragon Digimon. For that reason, it is a Digimon that is considered exceedingly valuable by tamers and researchers of Dragon Digimon. It is cherished due to its personality of friendliness and overflowing curiosity, characteristic of Baby Digimon. 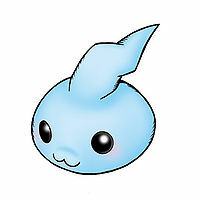 Just like other Baby Digimon, it spits acidic bubbles to attack, but as usual, their power is nonexistent. A small, blue-colored, Dragon Digimon child. Although it is small and powerless, it has the potential to evolve to every Dragon Digimon. For that reason, it is a Digimon that is considered exceedingly valuable by tamers and researchers of Dragon Digimon. 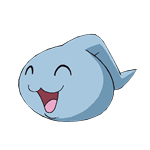 It is cherished due to its personality of friendliness and overflowing curiosity, characteristic of Baby Digimon. 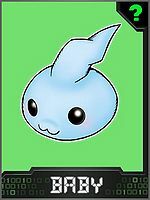 Just like other Baby Digimon, it spits acidic bubbles to attack, but as usual, their power is nonexistent. Anime/Manga Digimon Adventure 02: "The Unparalleled Union! Paildramon"
San no Awa  Acid Bubbles 酸の泡 N/A Frothy Spit Spits acidic bubbles. Chicomon is the partner of Motomiya Daisuke. Many Chicomon are seen at the Village of Beginnings. Chicomon is a rare Digimon which does not appear as a wild Digimon. It can only be born from a DigiTama. It can evolve to V-mon if above level 10 and Dragon EXP above 300, or Yuki Agumon if above level 10. Chicomon is only obtainable from a DigiTama. Chicomon is obtainable in the Sunburst exclusive field, Task Canyon, or through matching. Can evolve to V-mon if above level 10, Friendship is above 50%, and you've befriended Chicomon before, or to Monodramon if above level 15 and Dragon EXP above 300. Can evolve to Betamon or V-mon. ↑ Digimon Adventure 02: "The Unparalleled Union! Paildramon"